I also had the opportunity to be part of the Undergraduate Research Fellowship through DIY Diagnostics. The summer fellowship provided a platform to pursue my passion for research without any other commitments. I joined The Keystroke Analysis for Identifying Parkinson’s Disease in Typing Patterns research study which focuses on creating a new method that aids in diagnosis and monitoring of Parkinson’s disease patients. I had the opportunity to combine human interaction with research. I visited participants who consented to be part of the study at various sites to collect their typing data alongside other students. Each participant is part of a longitudinal study so they would complete one test each month for six months. After data collection, I collaborated with peers that were part of the project on completing data analyses on RStudio and Microsoft Excel. Additionally, I was glad that I was able to pursue a project that aimed to create a positive change in patient care. The experience of data analysis will be a valuable resource I will carry into my future research. Through our group meetings, I received further insight into how researchers can find solutions for obstacles that they face. Furthermore, each day the students in the fellowship met to discuss their progress which I found very interesting. Overall, the fellowship promoted collaboration and team-work. I am excited to continue my role in the study in my second semester! My goal for this semester is to collect more typing data from individuals affected by Parkinson’s and to collect typing data from individuals without Parkinson’s for a control group. In this way, we can conclude more detailed findings backed by data. 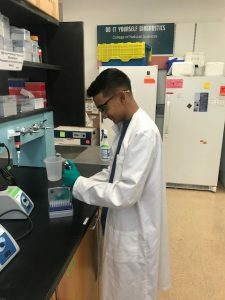 In conclusion, the DIY Diagnostics lab is an excellent fit for someone looking to try a new experience, collaborate with others, and pursue research that has the potential to create a change in medical diagnostics!